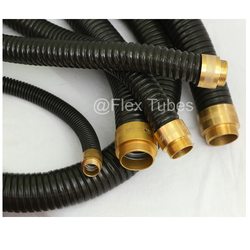 Liquid Tight PVC Coated Flexible Conduit, Size: 1/2"
Owing to years of experience in the industry, we offer our patrons an extensive range of PVC Coated Flexible Conduit that are used in different industrial applications and are dimensionally accurate in nature. With the aid of advanced machines and tools, we are engaged in offering superior quality Liquid Tight PVC Coated Galvanized Flexible Conduit. A heavy duty, hot dipped galvanized steel flexible conduit (square locked & helically wound type) is covered with closely fitted (sleeved) non-sliding PVC coating (formed by continuous extrusion). It is commonly used for general electrical wiring where flexibility & mechanical strength along with protection against ingress of particles & most common liquids are highly desired. Safeflex Galvanized flexible conduits and galvanized flexible PVC coated conduits are available in Carton Packing with SPOOL and in Gunny Bag Packing too. 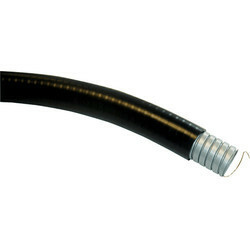 This type of conduit is extremely versatile and can be used in dynamic as well as static.